Nepali Patro ("नेपाली पात्रो") - Nepali Calendar is online traditional Lunar Calendar/ Bikram Sambat Calendar. It helps to keep track of important dates, events, and festivals in our own Nepali native language. Nepali dates, events, and festivals are remembered and promoted using this tool. I am sharing you the desktop version of Nepali Parto. The size of this file is as small as 11KB so this will not harm the performance of your PC. 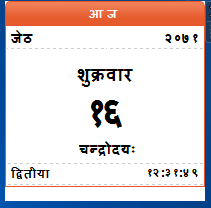 You can find similar calendar widget at http://www.ashesh.com.np/nepali-calendar/ Best ever calendar widget for me. yo calendar ho ki tapai ko foto promotion ho?